Cosmic Gate tell us all about Materia, Chapter 2! 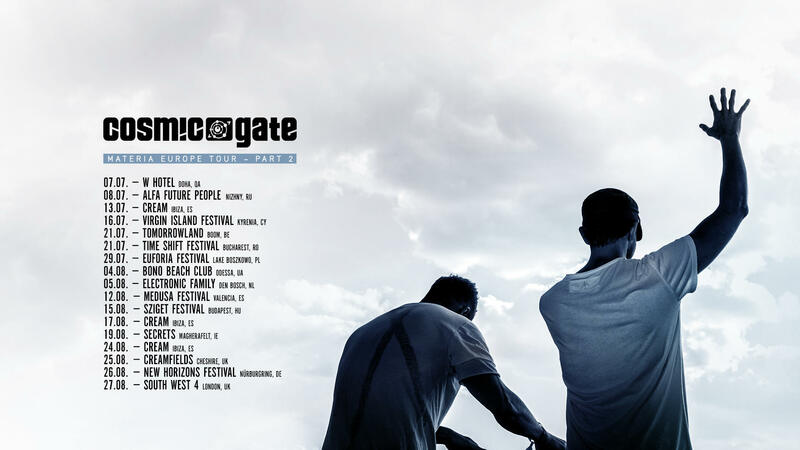 The Dynamic German Trance duo, Cosmic Gate is back again this year with a highly awaited album! A successor to Materia, they release the second part to their album, Materia, Chapter 2, which features a lot of interesting work and collaborations. The album will feature nine stellar collaborative tracks that are sure to delight the listeners. The LP sees Cosmic Gate team up with the likes of Markus Schulz and Super8 & Tab for this brilliant collection of new material. Avid fans of the group will surely be able to recognise the familiar sounds with Eric Lumiere and Alastor, both of whom appeared on Materia Chapter.One, released earlier this year. The Materia series will also see a double CD release this September containing both Chatper.One and Chapter.Two. 1. Hi Nic and Bossi! It’s lovely to speaking to you again! After the roaring success of Materia, Chapter 1, are you excited for the release of this album? Do you think it will surpass the previous album? Hello guys, thanks for having us back! And yes, we are very excited about the release of Chapter two, which now finally makes the Materia story complete with the physical release of the CD, which brings both Chapters together as one Album. For this reason we wouldn’t even want to compare things, we feel the two singles from Chapter two that are out now (Tonight with Emma Hewitt and AR with Markus Schulz) give a good hint that soundwise it walks in the footsteps of Chapter 1, but in the same moment adds up to it as well, feel free to check it out from September 1st. 2. What is the concept you are trying to showcase with Materia, and how did the idea of releasing it in phases or as chapters come about? Well to explain at first, Materia is the Latin term for matter, so basically the substance that all things are made of, in the end the basics of everything around us and even ourselves as human beings. When we started on first songs and demos for the album we got a feeling that even with pushing musical boundaries further, the music felt very fundamental Cosmic Gate, somehow very much us if we can say that, a lot modern bits and pieces from today, on top elements from say 5 to 7 years ago, but also reminiscing some of the beginning of Cosmic Gate as well, basically the best of our works during the years brought together, so musically essential Cosmic Gate somehow if we can call it like that maybe. That’s why we felt Materia is a great working title, and after a while we were like, hey, actually its better than just a working title, lets go for it, its different and simply reflects the music and our feel for what we were doing. And to split it into two parts. In the end it was pretty simply, we had too many good tracks that we wanted to release and could simply not get them done on time to release all in one. Another reason why we actually like the concept to bring out two chapters is, that we give our fans more time to really explore the music on each Chapter. To release 17 tracks as we did with Start to Feel is great, but when people 4 weeks after release ask, so when do we hear new music, then us as the people that have been busting on the album for a year don’t really know how to react to such a question, as it’s a project that took all our heart, soul, energy and mostly creative potential for a year, its not like pushing a button and say, hey, there is more music for you… So yeah we spread the release, and Chapter 2 is about to kick off soon, to make the story complete as said. 3. We see that the album is filled with collaborations. If you had to pick one track that you connected the most with, which one would it be and why? It won’t be fair from our side to put one of the tracks and collaborations over others, we simply like them all!!! we had the pleasure to work together with all these fantastic talented artists that were adding up so much to our work and made Materia what it is, it was a great experience, and we know it wasn’t the last work we had together for sure. 4. You will be going on an album tour across Europe. What can fans expect from the tour? well its the Materia Tour, so the main focus will be on new tracks from the album, on top we will play our current club tune favourites and some classics never miss in our sets anyways. In general its all about the music and the vibe we create together with our crowd! in the end every room, crowd, every night is different and we want to create a unique show each time, please come and check it out if you have the chance and have a good time with us! 5. What was the inspiration behind both the chapters of Materia? Can you tell us what it means to you’ll? 6. What was the idea behind naming your collaboration with Markus Schulz AR? How was the experience of collaborating with him? 7. You’ll have also released a deluxe collector’s edition of “Materia”. Could you please tell us something about it? 8. Cosmic Gate has been together since 1999, whats the secret of being together as a team for so long? And Nic we absolutely love your productions, any plans of coming out with more tracks/remixes? The secret in the end simply is the chemistry that we have about music in general, but even more when it comes to everything about Cosmic Gate. We basically never have different views on things or directions we want to go to, same counts for our DJing, we add up to each other in a very unique way, otherwise it would never work the way it does. About future solo work, the wish is there from both of us to do different stuff like Nic Chagall solo for example , simply time is extremely limited next to CG and all the touring and productions we do, so lets see whats possible, we keep you guys posted. 9. How was your experience at the Trance Energy stage at Tomorrowland? That stage looked insane! Yeah the Trance Energy Stage at Tomorrowland looked insane indeed, the stage and actually the whole hall looked just fantastic with the visuals going up through the whole ceiling even. we had a blast playing and world premier so many tunes from Materia on top, if you didn’t have the chance to see the show, its online on our Youtube channel, we are glad everyone that has not been in Belgium can enjoy the show now nevertheless. 10. Any message you’ll would like to convey to your fans across the globe? Tomorrowland announces a plethora of Trance stages for their 2018 edition! 10 Trance Podcasts you need to hear!